Only add enough mussels to cover the bottom of your pan. After adding the mussels cover the pan with a glass lid so you can watch for the shells to open. This should take about 4-5 minutes. As the shells open remove the mussels one by one and place them in a soup plate. After all your mussels have finished cooking pour the broth over the mussels and they are ready to serve. If you prefer to add them to another dish you can remove the top shell with a short dull knife or clam knife by inserting the knife between the top shell and bottom shell. Work the knife around to cut through the hinge muscle. Now slide your knife between the mussel and the shell and slowly detach the mussel from the shell. You should discard any mussels that do not open after being cooked for more than 6 minutes, or if the shells are cracked. Mussels are usually served directly from their shells, usually as an appetizer or first course. Muscadet-Sur-Lie, Chablis, and Semillon are excellent paired wines with mussels. They also pair well with a fresh bread, to soak up the flavors of the broth and natural juices. Mussels are high in protein and low in fat and cholesterol. They are also rich in vitamin C and B12. Mussels are best cooked and served fresh, however they will keep in the fridge 48-72 hours if stored properly. 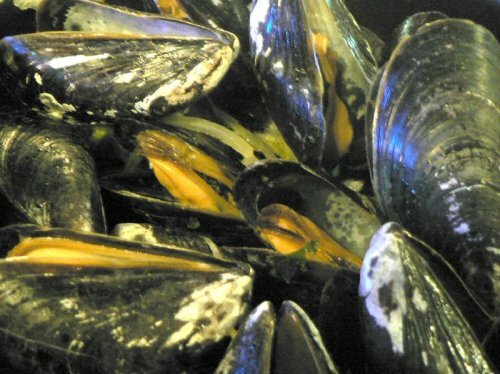 After rinsing your mussels place them in a bowl or tray and cover them with a damp towel and place them in your fridge.